On May 2, 2017, BSTI’s Tripp Fischer served as a guest lecturer for Dr. Angelo Lampousis’s Environmental Assessment class at the City College of New York (CCNY). 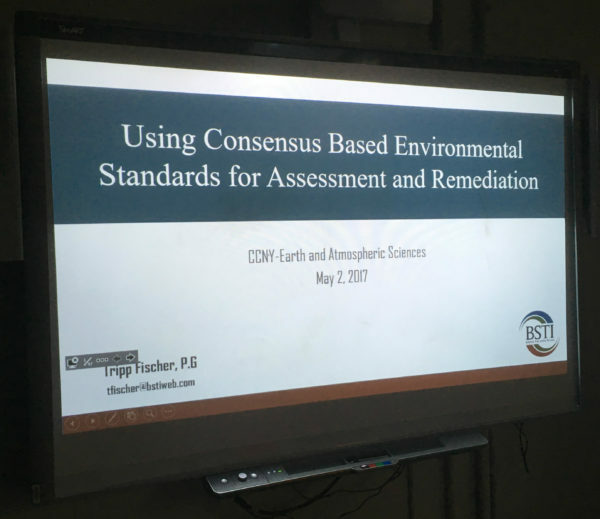 Tripp’s presentation focused on using consensus-based standards (CBS) for environmental assessment and remediation strategies. This fell in step with Dr. Lampousis’s efforts to implement CBS into the environmental curriculum at a university level. Concepts covered included stakeholder buy-in, concurrence, standards incorporated by reference in law, and environmental liability. CCNY is a public college in Harlem, NY, and is part of the CUNY University system. With an enrollment of over 16,000, CCNY alumni claim 9 Nobel laureates in physics, medicine, economics, and chemistry; the most of any public school in the United States.